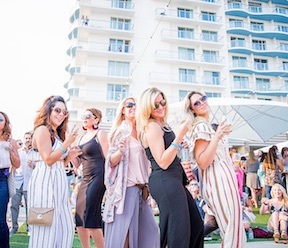 The quintessential California wine tasting experience – sun, sea, food, wine and music – all come together at this sun-splashed wine festival overlooking the award-winning beaches of Huntington Beach. This event gets under way at noon for VIP holders – and 1:00pm for regular ticket holders. Thousands of wine lovers will hit the sun-splashed beachside location for a day of sun, wine, food and music. Hundreds of premium California wines are served up along with the best of the regional craft brews and a dizzying variety of foods to sample. Artisanal cheeses, breads, olive oil, as well as shellfish, salads, chocolates, cakes, and more! A live band keeps the beat for this all-day feast for the senses where wine and food are king and queen.